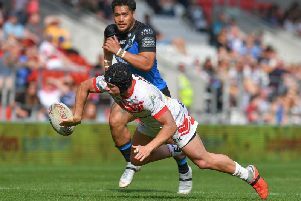 Justin Holbrook cut a frustrating figure at the end of Saints’ 24-22 defeat at Leeds on Thursday night, trying to come to terms with the early loss of play maker Matty Smith, the sin-binning of skipper Jon Wilkin at a crucial second-half stage and a lop sided 11-3 penalty count. The St Helens head coach said: “Matty is our main organiser and it made everything harder for us when he went off, yet we nearly got away with it and that would have been huge. Neither was the head coach too happy about Wilkin’s yellow card with less than 20 minutes remaining and the clash balanced on a knife edge. He said: “I thought it was massive in the context of the match, as well as being harsh. We were also on the wrong end of a penalty count but still came close to winning against quality opposition on their home ground which shows the players love playing for each other.